I’m here today with exciting, scary, nervous-making news: I’ve launched a Kickstarter! 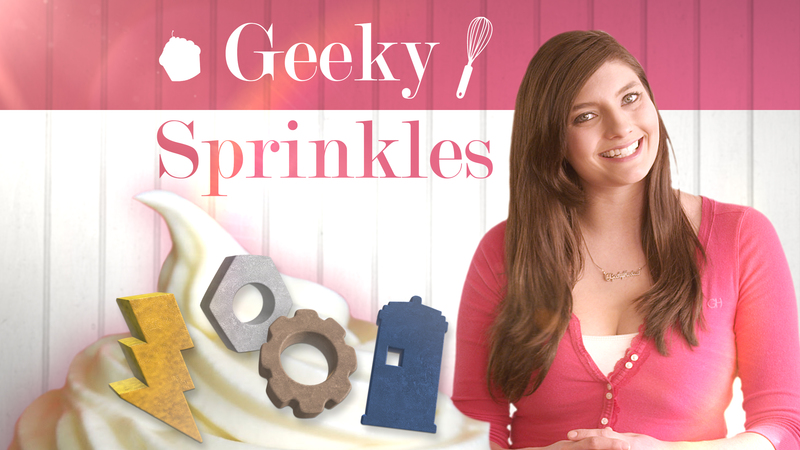 The Kickstarter is for a Geeky Sprinkle line. I’m starting with steampunk shapes, lightning bolt shapes, and blue police box shapes. So all you steampunk, comic, Harry Potter, and Doctor Who fans, rejoice: You will finally have pretty sprinkles to put on your cupcakes or ice cream sundaes. Basically, I’ve been wanting more fun, geeky sprinkles for a while and about a year ago I started researching options of having them made. I found the best of the best of the best people to make it happen, and I’m so excited to start making these sprinkles a reality. I hope to bring a bit more fun into kitchens and bakeries around the world in a different way than my blog already does. If you’re as excited about the sprinkles as I am, please pledge to the Kickstarter! If you know someone else who would like these sprinkles, please share the project with them! I need your help to make this a reality. And if nothing else, just check out the video on the Kickstarter page. The folks at Cinesaurus did a fantastic job making a ridiculous, fun video for me and I’m excited to share it. Love this so much!!!! A couple friends linked me to your Kickstarter and I could hardly contain my excitement. I just had an Etsy shop create me custom superhero colored sprinkle mixes. While the colors are awesome, to have them shaped like what you are doing is a dream a come true. I’m interested, but i would love to see these at scale. If it helps, they’re an average of 5 mm each! I’m working on getting a to-scale pic. These are so great! Can’t wait to decorate with them!! This is such a great idea and I look forward to seeing a wider variety from you! I’d love to see more comic book sprinkles! Found you today over at the SITS Girls! What a neat idea! I love sprinkles!!! Found you from the SITS FB Group! Ok, how is it that I have not found you before today? I am so glad you posted to the SITS group. I love this! Defiantly going to share this with several friends that I know would love to make use of these.